Standard registration for Members, Guests, and Visitors to the Florida Coalition of Rail Passengers Fall Members Luncheon and Meeting. Your registration includes a buffet lunch, as well as access to the meeting and guest speakers. See you Saturday, November 5 at the Clarion Hotel, DeLand, Florida! The FCRP Fall Members Luncheon and Meeting will be taking place on Saturday November 5 at the Clarion Hotel, 350 East International Speedway Boulevard in DeLand. The cost for the lunch and program will be just $25 per person. Meal will include an all you can eat buffet. Speakers will be: Marianne Gurnee of SunRail and DeLand Mayor Robert Apgar (scheduled to appear). For for those who wish to stay overnight at the Clarion, the rate will be just $79 per night. Please telephone the hotel at 386-738-5200 and indicate you are an FCRP member to get the special rate. For more information on the Clarion, click here. The site of several past NARP and FCRP meetings, it is the former Holiday Inn DeLand. Please register for the luncheon and meeting no later than Saturday, October 29. Advance registration is required. Guests welcome. Sorry, no "meeting only" registrations are available. Registration online and pay with your credit or debit card at our website, www.fcrprail.org, or send your check for $25 per attendee to: FCRP, P.O. Box 236513, Cocoa, FL 32923-6513. Questions? Email us at fcrp@fcrprail.org. Take the Train to the FCRP meeting! 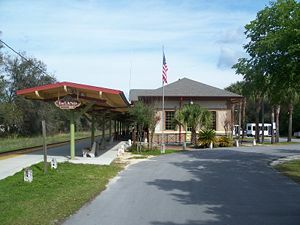 DeLand is an Amtrak city. For reservations, call Amtrak at 1-800-USA-RAIL or visit www.amtrak.com.